Browse: Home / Misc. / Test Your Reaction Time! Check out this cool flash game that tests your reaction time by how quickly you can tranquilize an escaping sheep. No joke. Check out the score on sheep #1 below. 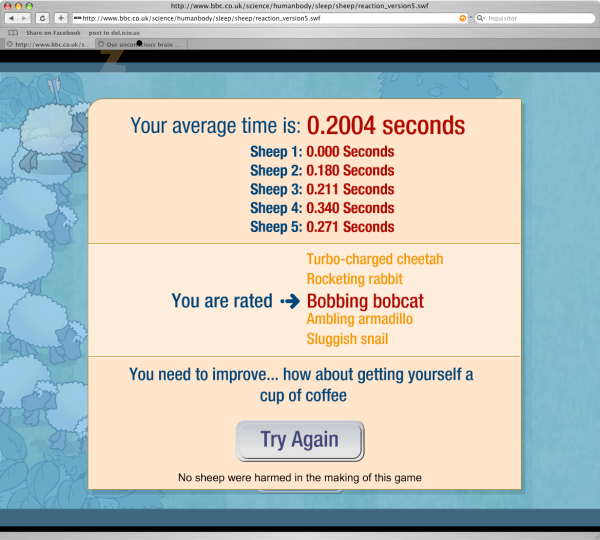 Yup, I got zero seconds on the first sheep but became a bobbing bobcat by the end. D’oh! Nice Mike. Hehe…, your 20 minutes is long gone Justin, at least it was spent well, eh! Ugh, I’m now addicted and feeling upset that I can’t get the .000! I’ll be at this all day!!! My hand eye coordination is terrible. thats probly why I don’t play video games. Hi Adam, Loved the game. I hope I will not be too addicted to it from now on. it’s not loading for me, do i need a plugin or something? Yup, tried it before, I got the 0.000 secs score too. Pure fluke! Great fun though lol. No!! I got 0.000 secs! I couldn’t believe it! this is a really great game! Great game to spend some time, at the end they say no sheep’s are harms 🙂 he..he..
Haha, I normally think these games are really stupid, but this one was actually really funny. Thanks. OMG! Very addicting! I hate you for showing me this game! I had fun with this game, I haven’t played a flash game in years but this was fun to get a break for everyday life..I feel sorry for Eric who is working all time..
i love this game but i am not very good at it. my reaction time is so bad. i will be back to try again. I also love to play this.